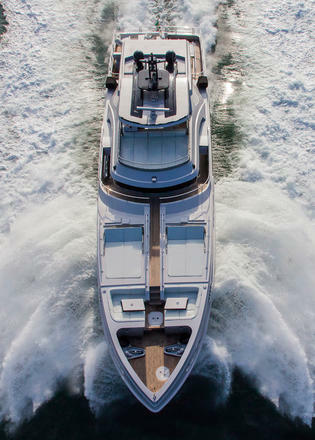 Three standout features underline the striking, robust boats that Brazilian builder MCP Yachts is known for: speed, low power consumption and impressive ocean-crossing range. Those qualities might seem contradictory but not for MCP, and its new 106 LE (Limited Edition) superyacht Mars continues the mission. The 32.31 metre offers bold, modern lines, likely to appeal to customers who prefer less conventional vessels, a 26-knot top speed and exceptional fuel efficiency and range when cruising at a more sedate pace. Mars’s styling is innovative at first glance. 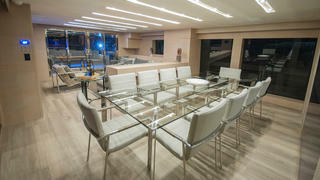 Glazed bulwarks on the side decks match floor-to-ceiling windows in the main saloon for unobstructed views. Further forward, where the yacht becomes full body, the line of the bulwark becomes a fashion plate that cuts through the vast windows for an unusual look, but one that works. The owner of Mars became an integral part of the project. He came to the shipyard when the hull was nearly completed, specifically looking for a yacht in aluminium, which he considers a superior and efficient material. It’s how the custom hull colour of Mars, which really showcases the metal, came to be. Internally, aluminium construction offers the advantage of a double bottom that provides space for black water and fuel oil tanks. Their location helps keep the centre of gravity low and makes them easy to access. MCP rose to the challenge of completing Mars to the owner’s specifications. “He had the advantage of waiting less time to receive the final product [around 12 months],” says Chaves. 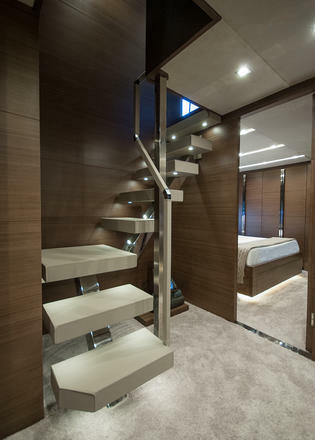 “He went on to customise Mars's interior based on his experience of charters around the world.” His requests ranged from a simple closet handle to specifying the entire décor of the five suites (the master suite forward on the main deck and four guest suites on the lower deck). The master suite of _Mars _compromises on nothing. 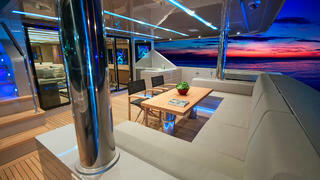 Its décor and layout are based on what the owner and his wife liked in other superyachts. 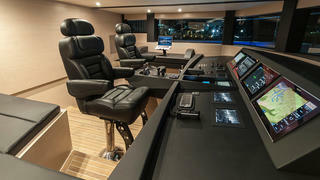 At its entrance is a study with two computers (as the owner works on board) and a TV. The suite has a large walk-in wardrobe, a seating area and his-and-hers bathrooms forward, featuring a huge rain shower in the centre. In the initial plan for the 106, the galley was on the port side of the main deck. However, as the owner uses Mars primarily for day cruises for work, he requested a layout change that meant reshuffling both the crew and galley areas. 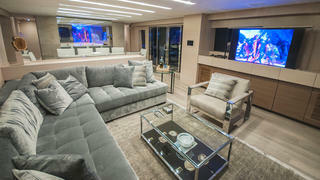 Since the crew does not spend long periods aboard, there isn’t a dedicated captain’s suite. A large galley with capacity to serve guests for two to three-day trips occupies the space forward on the lower deck where the captain’s cabin was originally placed. Just forward of this, the crew quarters offer the bare essentials, with two cabins that can sleep up to six in triple bunks and one bathroom with a separate shower and toilet area. A pantry on the main deck, leading from the galley below, eases service on Mars. The division is quite clear: crew and service activity is on the port side, while socialising takes place on the starboard side. Guests have complete freedom and privacy throughout Mars, with access to a bar, wine cellar, dining area and dayhead off the main saloon. 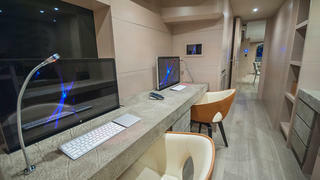 A 75-inch TV is embedded in a panel behind the dining table (Mars has 14 screens in total, ensuring the owner is always informed about what is happening in his field of business). To starboard, a sliding door off the dining area opens to a drop-down balcony with a fun feature: a glazed floor for sea views beneath one’s feet. Mars, which meets classification society RINA’s international standards, is fully automated, with all operations controlled by tablet or smartphone. A remote control enables navigation from anywhere on deck through a tablet, with engagement and disengagement of the engines, bow thruster and stern thruster. It is even possible to start up the boat, move it out to sea and dock it again while operating the remote from shore. The raised pilothouse on _Mars _offers a wide view for driving. A software system created by the shipyard keeps navigation records and monitors and displays functions for all the equipment (engines, generators, navigation lights, batteries, pumps, etc.) in a central location, as well as interacting with the entire boat. 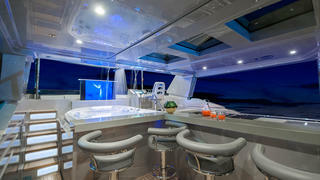 The flybridge is an entertainment space, with a table for eight people, full bar with barbecue, a huge spa pool with a waterfall, water misters and a large sunbed with capacity for several people. A spacious beach club also stands out. 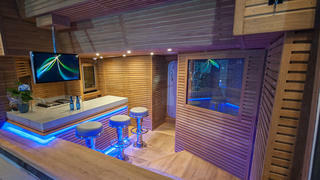 It includes a full kitchen behind a sit-down bar, a dayhead, a shower and a sauna for shared use. It is accessed through a large automatic door in the stern. Ensuring comfort on board was a key requirement and acoustics were not overlooked. 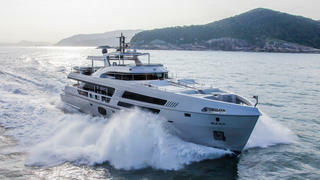 To combat noise below the waterline, the engine room is thoroughly sound-insulated. The generators operate in rotation, according to activity inside Mars. 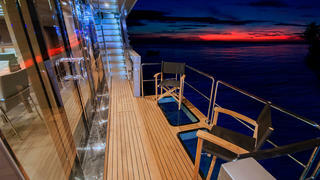 At night, for example, the generator located on deck is generally in operation to preserve the cabins’ serenity. Equipped with two 1,825hp Caterpillar C32 Acert V12 engines, Mars has an impressive 4,000 nautical mile range cruising at 10.5 knots. At this speed, total fuel consumption is 87 litres per hour, a testament to its efficiency. On the other hand, she can also get up and go when required, with a fast cruising speed of 20 knots. The series name is indicative – the model is indeed a limited edition. 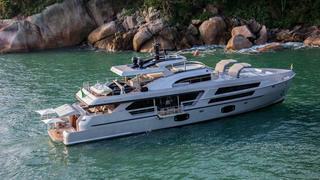 The second 106 LE, called Paradiso, was recently launched, sporting a bronze hull colour. In the coming years the yard expects to build three more models (the asking price of a 106 is $9.7 million), bringing this Limited Edition series to five. Get one while you can.